Awhile back, Charlie wrote about how during the Great Depression—when there were no safe places to put ones money—folks would hide their savings in some pretty strange places. Among the most popular spots: beds, walls, the backyard, doors and cabinets. Before the Great Depression, bank runs were not uncommon. In fact, one-third of banks failed prior to 1933. Because of the limited faith of the public towards banks, President Roosevelt, helped establish the Federal Deposit Insurance Corporation (more well-known as the FDIC) in 1933. It was a guarantee to the American people that if you happen to put your money in a failed bank backed by the FDIC, the government would pay you back (up to $2,500 at the time – now, $250,000). Backed by popular opinion – the FDIC was an immediate success in restoring public trust. In the four years preceding its formation, 9,000 banks failed compared to just nine in 1934. It’s important to note the FDIC is not funded by public funds – but by member banks’ insurance dues. While there are still folks who prefer to keep their money in the mattress or dresser drawers – it’s more common for folks to open up a checking or savings account with a bank to keep their emergency savings. I believe the point of an emergency fund is that money is available if you get into a crunch – but not so accessible that you could (in a weaker moment) withdraw it on a whim. A very traditional and ultra-safe option is a checking or savings account. I currently have two separate savings accounts with my bank. The drawback of any checking or savings account is that you are likely to get a very low interest rate. So, if you plan to go this route, I advise trying to find the best rate you can find in an account. Going against rule #3 a bit here – but sometimes, you can find a very low-risk stock out there that may be trading at an unusually low price. And, when I’m thinking of low-risk – I’m thinking of very stable brands that have stood the test of time and/or goods/services that folks will continue to need regardless of the economy (ie, food, utilities). I recently stored some savings that I knew I wouldn’t need for some time and purchased some safer stocks that ended up netting me more than I could get from traditional vehicles. The big downsides to storing your emergency funds in stocks is the inherent volatility, higher-risks and time to withdrawal (you may need your money at some point only to find that your stock is down). Unless you are very comfortable with the market as well as the fees associated with trading – I would make this one your last resort. 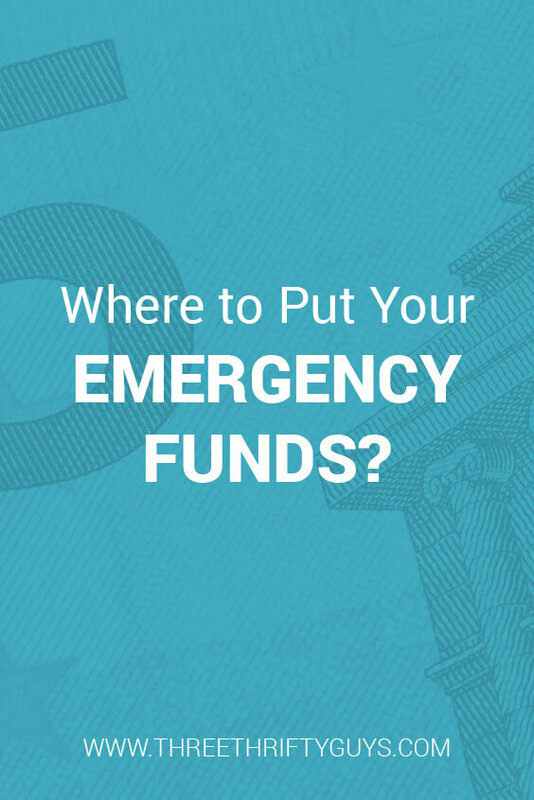 One of the best places to store your emergency fund savings is the money market. Money markets fit a lot of the three criteria we mentioned above: money is accessible, insured (if not money market funds), and are relatively low-risk. When I was first starting out, I opened a money market account with a high interest rate–higher than I could get with any bank account at the time. The only downsides to money markets is there may be a high initial deposit to open an account and/or a short delay to withdraw funds. This article was brought to you by our friends at Northpointe Bank. All opinions expressed are our own. We have most of ours in a Captial One 360 account which doesn’t pay a lot of interest but at least a little bit. We can have it transferred over to our main checking account within 48 hours. We have credit cards that would effectively bridge this gap at no cost. I love my Provident CU Rewards checking account. They don’t have a bunch of transactions to fill, just a modest $300 a month spend requirement, one direct deposit/ACH, and email delivery. The APY is 2.1% up to $20,000. I always figured an emergency fund meant this was money you would need immediate access to (or close to immediate). So we have used either a savings account or an online money market account with check writing privilege. Interest is negligible either way. And interest is relative. I remember when money markets were paying 10-14%. Of course mortgage rates, if a bank would write a new mortgage, were 20-22%! Hey Phil. I’ve heard stories from my older relatives too about mortgage interest rates in the double-digits. Crazy! We can hardly fathom those today.